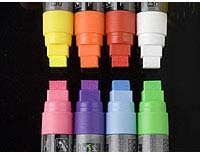 Chalk Markers Offered In Many Tip Sizes and Color Choices! Are you looking for a chalk marker that isn’t too expensive? This site has all of the solutions to custom advertising needs. These chalk markers for sale here are offered in just about every color of the rainbow, as well as well as some newly added earth tones. 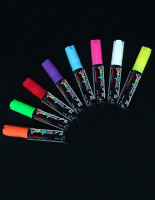 In addition to the many neon color choices, there are a few different tip sizes and shapes as well. Buy this chalk marker with a chisel, bullet, or wide tip, all of which can be used to make different types of text or graphics on erase boards or storefront windows. 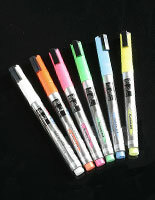 The smaller pens are great for fine details while the wider tips are best-used for coloring in large graphical areas. 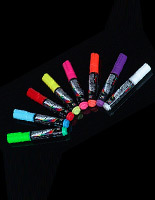 These chalk markers are much different from the traditional chalk used in school classrooms. The largest difference being that these neon pens are wet and not powdery limestone. 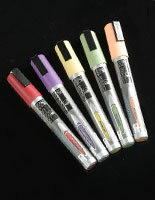 This chalk marker dries quickly, does not cause dust, and does not rub off from incidental contact like the older style chalk. 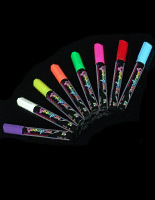 This fluorescent glass pen is the preferred writing utensil for most restaurant and bar owners. 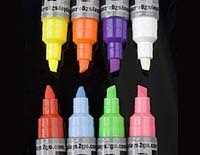 Can these chalk markers be used for outdoor signage? 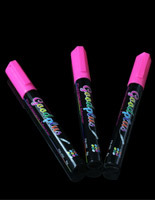 These neon wet erase pens, when applied on a sign, can withstand some mild weather conditions, but should be brought inside during significant precipitation. 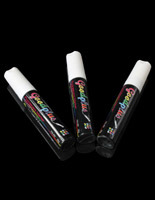 This chalk marker requires a damp cloth to remove from the non-porous surface; therefore, it is semi-permanent and will not fade over time. For more information regarding the durability of these fluorescent ink pens, contact one of our customer service representative. These chalk markers makes clean up and sign changes a breeze. Once the neon pens dry, simply use a damp cloth to make a correction, or completely erase the message. No more airborne dust or chalky residue. 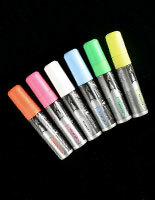 The chalk marker shown above can be used on several different writing surfaces such as glass, acrylic and whiteboards. 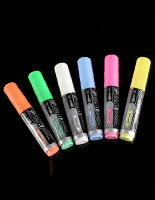 These fluorescent pens are not limited to just non-porous chalk boards. These chalk markers can also be used on metallic surfaces to create unique marketing signage! Enhance custom messaging on company vehicles, mirrors, glass walls, aluminum table tops, and other non-porous surfaces. What types of writing surfaces can a chalk marker be used on? 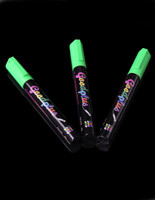 These neon window pens work best on a non-porous writing surface such as glass, chalkboard, and some plastics. 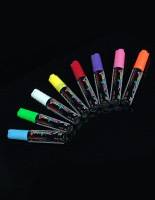 Most buyers prefer to use these chalk markers on a blackboard surface, as the black coloring makes the fluorescent colors “pop-out” at the intended viewers. Another popular writing surface used with these wet chalk pens is a glass board or storefront window. Now more than ever businesses are looking for new and innovative ways to capture shopper’s attention. This chalk marker, when used on a storefront window will do just that. With their vibrant colors and long lasting appearance, passersby are sure to take notice of the custom message created with these colorful pens! 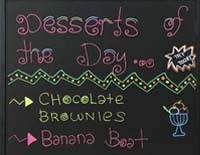 Use these chalk markers on a sandwich sign at an amusement park, a fair, or a flea market to create a vibrant display. The neon colors of these fluorescent wipe-off pencils are enticing to viewers and exciting to use. 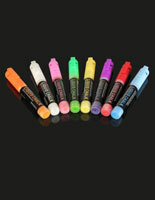 A new and exciting product to use with a chalk marker are edge lit message boards. The vibrant color of the wet chalk, combined with the flashing LED lighting makes this a must-have marketing tool for any bar or restaurant. Use these chalk markers to create a sign for drink specials, or a schedule of events coming to your establishment. Make an exciting sign for a lobby with a fluorescent board and colorful markers. Patrons will love the look of the custom neon signage, and certainly stop and take notice of your important message. Just like whiteboards, and other non-porous materials, these edgelit write-on boards wipe clean with a non-abrasive wet cloth. 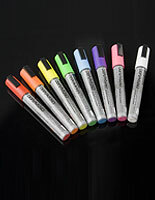 More and more restaurants and cafés are choosing these wet erase markers and lighted signs in lieu of the typical whiteboard and dry erase pencils for their menu signage. Most in stock items received prior to 3PM EST ship the same day. The rest of the orders processed after 3PM EST on weekdays ship the following business day. There are a few restrictions with custom printed graphics and large display case units that may have a few days of processing prior to shipment. With more than 7,000 display fixtures offered, shoppers are sure to find wet pens, or a wide range of other display solutions here. We sincerely appreciate your patronage, and hope to do business with you again in the near future!